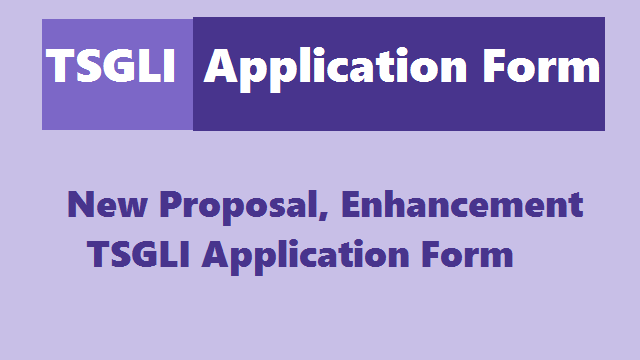 Download the TSGLI New Proposal and Enhancement PDF Application Form: As per the Govt Order.No.368, the Government have introduced the slab rates of compulsory premium towards Government Life Insurance Scheme(GLIS) for the State Govt. Employees. The Govt. orders No.231 were issued to revise the pay slabs for deduction of GLI Compulsory Premium from all the State Govt. Employees with reference to the RPS, 2010. Consequent of implementation of Revised Scales of Pay, 2015 to the State Govt. Employees issued in the reference TS Govt. Order 25, it has become necessary to revise the slab rates of premium towards TGLI Scheme with reference to the pay drawn by them. 1. The above revised premium rates shall be effected from the pay of June, 2015 payable on 01.07.2015. 2. All the employees must increase their premiums according to the revised rates specified above and also submit requisite proposal form after recovery of first revised premium from the salary and take Insurance Policy according to the revised premium from the Insurance Department. 3. Whenever the premium is enhanced, proposal form has to be submitted and additional policies have to be obtained. 4. Unless proposal form is submitted and policies obtained, the employees will not get Insurance coverage for the premium paid. 5. The Drawing and Disbursing Officers concerned are solely responsible for effecting the recovery of revised premium from all the eligible employees (i.e., who are above 20 below 53 years).